I think it’s time to start thinking of Spring! It’s snowing today here in the East Coast. ? And what does a Brazilian girl that can’t wait for Spring do? Plan her next tropical vacation, obviously! Yes, yes, I’m perfectly aware that I just recently came back from Brazil. But I just can’t help picturing myself in one of those beautiful beaches in Key West. Palm lined streets, a distinct mixture of cultures, home to a strong seafood scene and a tantalizing fusion of cuisines. Oh yes, Key West is definitely on my wish list for this year. 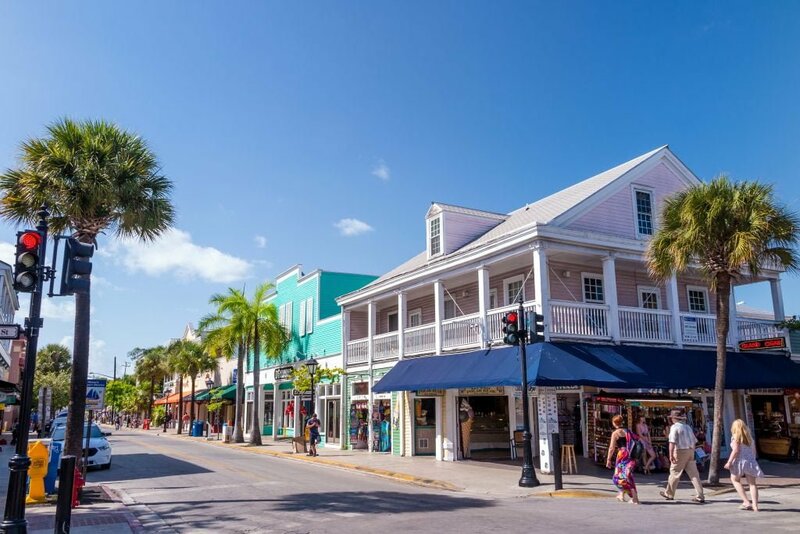 The Florida Keys is home to five districts, each with their own personality and attractions that make visitors feel like they are a world away. This southernmost paradise, which is Ernest Hemingway’s favorite destination, is just miles from Cuba and has enviable beaches, weather and food. And, at night, the street is lit up with vibrant sidewalk cafes that lure in passersby with delicious scents of their specialties. Not to mention nothing beats watching the sunset into the Gulf of Mexico from one of their hopping bars, while listening to live music. And the food? One simply cannot talk about Key West without mentioning its food. It brings together a multitude of flavors from exotic cultures, like African and Cuban, that are difficult to find anywhere else in the United States. As a guide to the restaurant and seafood landscape, Paul Menta of Three Hands Fish gave us the lowdown! A professional chef and community advocate with long locks and a chill attitude that makes him seem more like a pro kite surfer (which he also is! ? ), Paul is the perfect person to talk if you wanna find out the secret dining spots of Key West. The Philly native began his culinary career in Spain and France but eventually made his way to Key West to continue his love for competitive kite surfing. An athlete, distiller, chef, and entrepreneur, he has made it his mission to tap into all Key West has to offer! His most recent venture, Three Hands Fish, is a community supported fish market in Key West. Its members, chefs and home cooks have access to the freshest fish, shrimp, stone crabs and lobsters that came in on the docks. As Paul describes it, ”the first hand is the hand of the fisherman, the second the market, and the third is when the fish makes it into the hands of the individual or restaurant”. Paul is proud of his market as it brings local, traceable seafood to the people with plenty of variety, thus avoiding over fishing a specific species. Key West has seafood unlike anywhere in the world and the crucial ingredient is the water. The Gulf of Mexico mixes with the Atlantic Ocean making a perfect nursery for a plethora of fish, crab, and lobster. The fishermen of the region have come together to create a sustainable plan for the future of their industry, naturally controlling over-producing populations that threaten to take over the ecosystem. “Not only are visitors able to jump on the boat for themselves and go fishing in some of the clearest waters, but they are able to sit back and relax, knowing they can find the same fresh fish in local restaurants,” says Paul. If you are looking for a taste of the freshest seafood right on the dock, Paul suggests visiting The Stone Crab restaurant. This restaurant serves up some of the best of what Key West is known for, the stone crab, but they also do it in a stunning setting with an unbeatable view of the water. Housed in a resort built in 1956, the restaurant keeps alive the tradition of the fishermen bringing their catches straight to their dock, something that is no longer happening in other areas. And if you are looking for a place to stay, Paul recommends Ibis Bay Resort, home to The Stone Crab, which has a retro feel. Stop in for fun cocktails and great seafood that the restaurant catches themselves. Head here for stone crab, lobster, Key West shrimp, and more local fish. Be ready for a good time at The Stone Crab! For the die-hard cooks, go for a ride on a private charter to catch the freshest fish for yourself. Paul recommends Lucky Fleet, chartered by Captain Moe, to take you on this adventure and help guide you in hooking the best seasonable seafood. 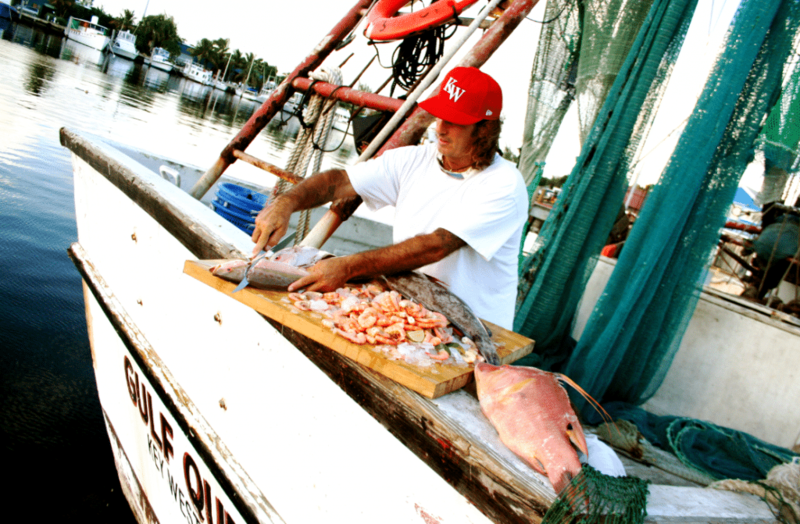 Moe has been fishing the waters around Key West for over 30 years and knows his way around. Whether you are an avid deep-sea fisherman or fisher-woman or this is your first time, Captain Moe will take you on a great adventure, not just a boat ride. From sailfish to tuna to grouper, they will lead you to the right spot. To learn how to prepare the seafood you just caught, take a class at Isle Cook where Paul himself will teach you how to cook local recipes and healthy meals with seafood. “Being a chef and commercial fisherman I can tell you there is no better teacher of how to use, care for, store, cook and eat a product than a fishermen. They have ideas and techniques that most chefs would die for….but they have to ask…..so we spread the word to them,” says Paul. 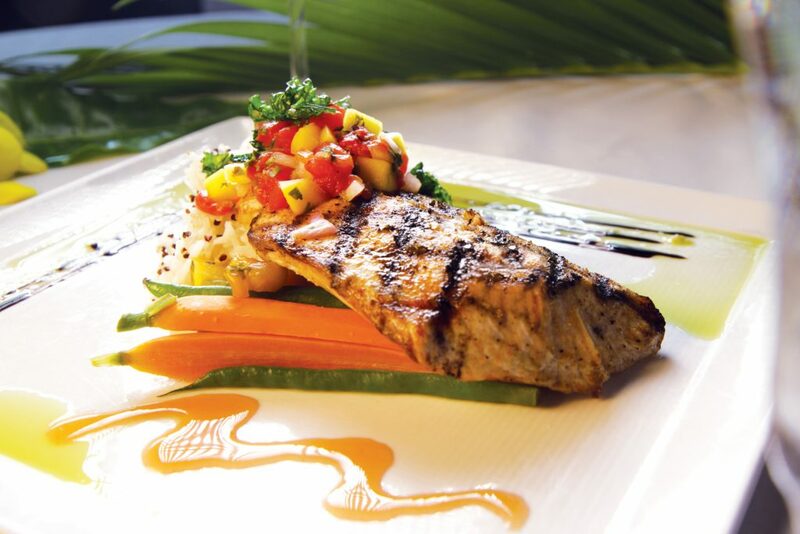 When visiting Key West, be sure to try fish you wouldn’t otherwise be able to get at home. Considered local to Key West are the Hogfish, Mangrove Snapper, and, as of late, the Lion Fish. Paul’s favorite? The Hogfish. This fish is caught by spear fishing, which is a fun challenge to try. Speared by yourself or someone else, Paul suggests serving the fish whole and he affectionately calls it the “Key West Turkey”, because it can be stuffed with lobster, onions, and herbs. 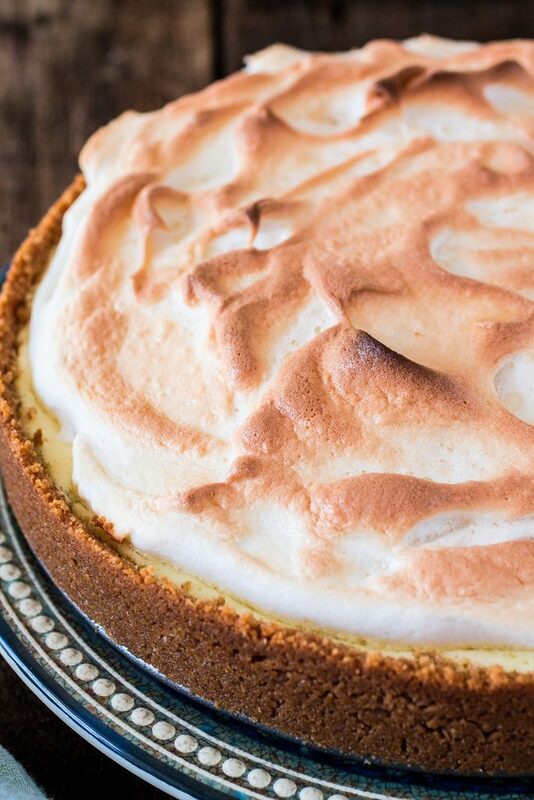 Key Lime Pie, of course! This American classic (and the official pie of the state of Florida) can be traced back to the end of the 1800s in Key West. Rumors say that Key West first millionaire, William Curry, had a cook named “Aunt Sally” who concocted the first pie from key limes. Aunt Sally’s recipe did not require the pie to be baked, relying on a chemical reaction between the condensed milk and the acidic lime juice that caused the filling to thicken on its own. Nowadays, consuming raw eggs can be dangerous, so most recipes will ask you to bake the pie. The baking also thickens the texture more than the reaction alone. As I mentioned before, key lime pies are originally made with key limes, which are more tart and more aromatic than Persian limes. However, if you can’t find any at your local store, just substitute for bottled key lime juice. Or whatever type of lime you can find! You might piss off a few Floridians, but the flavor won’t really be that much different. 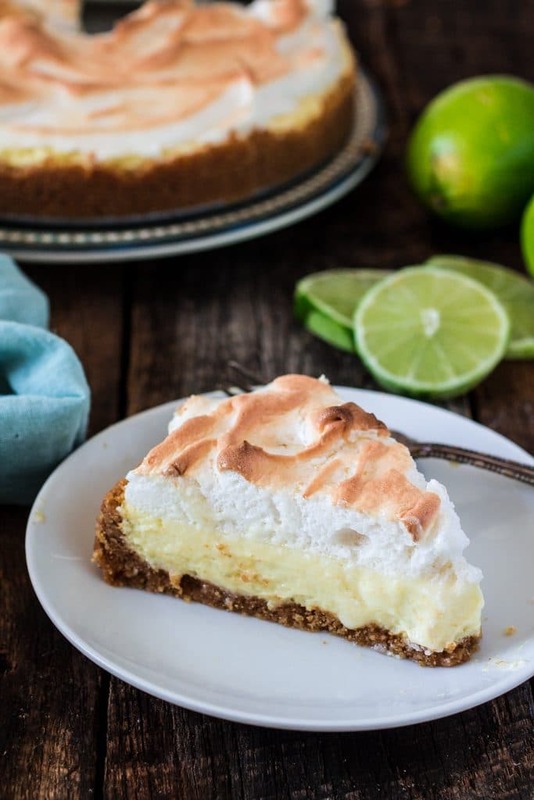 Fun fact: In 1965, Florida State Representative Bernie Papy, Jr., introduced legislation calling for a $100 fine to be levied against anyone advertising Key lime pie not made with Key limes. The bill did not pass. I hope you guys enjoy this recipe. Perfectly sweet and tart, this pie is a Key West classic and will inspire you to book your next beach vacation! In a food processor, pulse the crackers with the sugar until finely ground. Add the butter and process until combined. Transfer the mixture to a 9-inch springform pan and press evenly into the bottom and sides. Bake for 10 minutes or until set and golden. Remove from oven and set aside to cool. Leave the oven on. Using a stand (or electric) mixer, beat the egg yolks with the lime zest, at high speed, until pale and fluffy. Lower the speed and gradually add the sweet condensed milk, continuing to beat until thick. Then, slowly add the key lime juice, beating just until combined. Pour the filling into the crust and bake the pie for 10 minutes or until the filling is just set. Transfer to a wire rack to cool. Increase oven's temperature to 400F. Using the stand (or electric) mixer, beat the egg whites and the cream of tartar until soft peak forms. Gradually add the sugar and beat until stiff, glossy peaks form, adding the vanilla extract at the end. 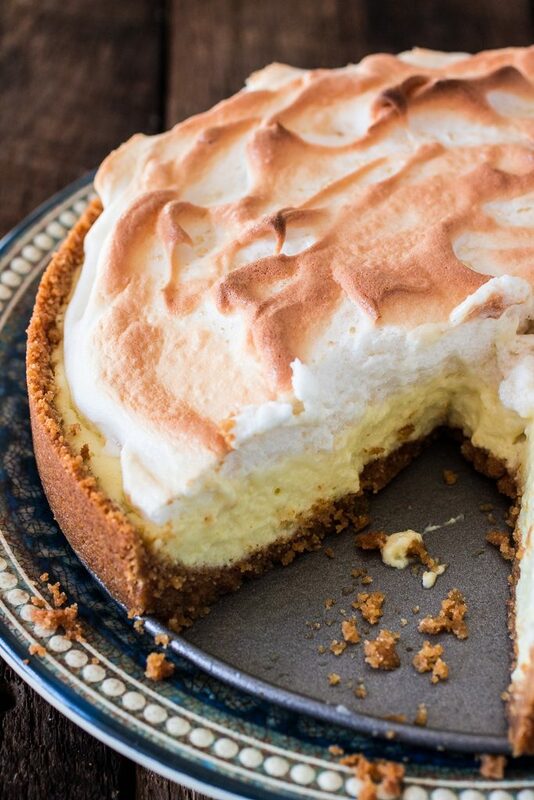 Scoop the meringue on the pie, making swoops and swirls with the back of a spatula. Bake the pie again for about 5 minutes or until the meringue is set and browned in spots. Be careful, as the browning can happen pretty quickly. Remove the pie from the oven and chill it for 2 to 3 hours before serving. I have never tried key lime pie before. Can you believe it?? Yours looks amazing! I need to try this sometime! Good to see you back Olivia!! 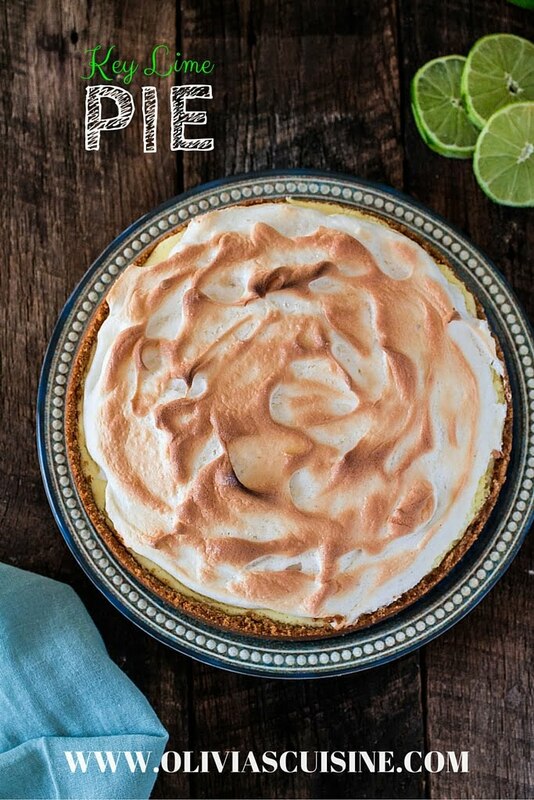 :) The key lime pie looks fantastic, reminds me of the sunshine ahead!